Two production Mazda MX-5s proved the car's bullet-proof reliability in the gruelling Britcar 24 Hour race at Silverstone over the weekend. Lining up on the grid of 60 cars, the road-going Mazda MX-5s contested one of the toughest motoring races on the European race calendar, pitting their nimble handling and modest performance against the power of purpose-built Mosler, Porsche, Aston Martin, Lotus and BMW racecars. The cars, prepared by Tunbridge Wells-based Jota Sport, were standard Mazda MX-5 2.0-litre models. Apart from the addition of mandatory FIA-approved safety equipment required for racing - a roll cage, race seats and harness, external electric cut-off and fire extinguisher - all the running gear, rear axle, gearbox and engine were completely standard. They may have been outgunned on the straights of the Silverstone circuit, but the agility and balance of the Mazda MX-5 gave them a superb advantage over vastly more powerful competitors through the newly modified circuit's 17 corners and curves. Despite the atrociously wet and foggy weather that saw the safety car called out over six times, the balance and poise of the MX-5 allowed the drivers to brake later into bends, carry more speed through them, and get onto the power earlier. Taking full advantage of this dynamism, the lead car of Mark Ticehurst, Owen Mildenhall, Jamie Corstorphine and Mike Wilds climbed relentlessly through the starting grid of 60 cars to second in class and 16th overall after 16 hours of racing. 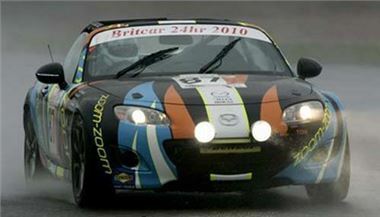 Similarly, in a peerless display of the MX-5's reliability, the second MX-5 - driven by Ollie Marriage, Ben Whitworth, Jim McGill, Matt Joy and 17-year-old karting sensation Jade Paveley - began reeling in the cars ahead. Having started the field on the back row, the car ran faultlessly for the full 24 hours with just refuelling and tyres required to complete the race. As it crossed the line 24 hours after it started, the MX-5 and its five ecstatic drivers secured 11th in class and 34th overall, having completed 474 laps and a distance of 1,509 miles. The lead car eventually retired from its position of second in class after an incident with race debris left it unable to continue with the race. "This was a superb result for Mazda," enthused Graeme Fudge, Mazda PR Director. "We demonstrated that a pair of stock MX-5s can compete with significantly more powerful bespoke racecars by relying on its outstanding handling and incomparable reliability. "While our lead car failed to finish for factors out of our control - a devastating blow after it had been running high up the order - our second car demonstrated the strength, reliability and handling of the MX-5 by finishing the race needing nothing more than fuel and fresh tyres."